Richard W. DiPietro Jr. (born September 19, 1981) is an American former professional ice hockey goaltender and current co-host of ESPN 98.7 FM's "Humpty & Canty show" with Chris Canty and Dave Rothenberg. DiPietro became just the second goaltender selected first overall in an NHL Entry Draft when he was chosen by the New York Islanders in 2000. In 2006, the team signed him to a groundbreaking 15-year, $67.5 million contract, but a string of injuries beginning in 2008, which limited him to 50 NHL appearances over the next five seasons, led to a contract buyout on July 2, 2013. DiPietro would retire after being released by the Charlotte Checkers of the American Hockey League (AHL) on November 26, 2013, with whom he had signed a tryout contract on October 25. As a youth, DiPietro played in the 1994 Quebec International Pee-Wee Hockey Tournament with a minor ice hockey team from Beverly, Massachusetts. DiPietro attended Saint Sebastian's School. He played one season (1999–2000) with Boston University in the National Collegiate Athletic Association (NCAA)'s Hockey East. In that one year, DiPietro was named to the All-Rookie Team, named Second Team All-Hockey East, awarded the team's co-MVP and was named Hockey East's Rookie of the Year. In addition, DiPietro nearly set the NCAA record for most saves in a game when he stopped 77 out of 80 shots in a 3–2 quadruple overtime loss to St. Lawrence University during the NCAA regional final. In his one and only Beanpot Tournament, DiPietro was named MVP and won the Eberly Trophy awarded to the tournament's top goaltender. DiPietro was drafted first overall by the New York Islanders in the 2000 NHL Entry Draft, out of Boston University, prompting them to trade Roberto Luongo. Islanders general manager Mike Milbury traded Luongo so that he could draft the highly-touted goaltender known for his mobility and puckhandling skills. DiPietro was the fourth American to occupy the top draft position in the NHL Entry Draft. A groin injury during training camp resulted in DiPietro starting the season with the Chicago Wolves, the Islanders minor league affiliate in the International Hockey League (IHL). He was subsequently called up twice to join the Islanders, but did not play a game until January 27, 2001, when he made his debut against the Buffalo Sabres. Though his NHL debut was widely anticipated, he played 20 games in the 2000–01 season and managed to post just three wins against 15 losses for a struggling Islanders team. He played ten games the next season (as well as one playoff game) before being called up permanently in the 2003–04 season. His goals against average (GAA) decreased from 3.49 in the 2000–01 season to 2.36 in the 2003–04 season. DiPetro with the Islanders in 2011. On September 12, 2006, DiPietro signed a 15-year, $67.5 million contract with the Islanders, topping former teammate Alexei Yashin's contract signed before the start of the 2001–02 season of 10 years. Newsday reported that the team offered him a 15-year contract in September 2005, but the NHL front office discouraged the Islanders from making such an offer. Instead, DiPietro signed on a one-year deal with the Islanders. DiPietro's contract—the longest under the 2005 NHL collective bargaining agreement—was nearly superseded in 2010. During the 2010 off-season, the New Jersey Devils attempted to sign Ilya Kovalchuk to a 17-year contract, but that offer was rejected by the NHL on the grounds of salary cap circumvention. On March 13, 2007, DiPietro suffered a concussion after a collision with Montreal Canadiens forward Steve Bégin when DiPietro raced out to poke-check a puck at the blueline at 15:41 of the first period. DiPietro returned for four games but then missed the rest of the regular season after he sustained another concussion in game against the Rangers. He returned to play games two through five of the Islanders' first round playoff series against the Buffalo Sabres. The concussion was the start of a string of injuries. DiPietro underwent surgery in the 2007 off season to fix a torn labrum in his hip. In 2007, DiPietro expressed a desire to become more of a team leader. He said, "I'm a competitive person, and I have a tendency to have a short fuse with guys sometimes. That's something, as a leader, that you just can't do." On November 19, 2007, DiPietro got his 100th NHL career win when the Islanders beat the New York Rangers 2–1. DiPietro was selected to appear in his first and only All-Star Game in 2008 as a reserve, but was later named the starter after New Jersey Devils goaltender Martin Brodeur dropped out. During the Skills Competition the night before, DiPietro injured his hip during the Shootout Competition. DiPietro continued to play until the Islanders no longer had a chance to make the playoffs and on March 19, it was announced that DiPietro would miss the remainder of the 2007–08 season because of the hip surgery. On June 3, 2008, DiPietro went on a Sirius satellite radio show being hosted by "Bubba the Love Sponge," where he told Bubba he would be undergoing knee surgery later that day. The surgery was done on the meniscus in his left knee. DiPietro sat out the first four games of the 2008–09 season (or, controversially, was on the bench as the backup) before starting the team's fifth game in Florida. He played two games after that, but left after the first period his third game back. After that, he was placed on injured reserve for an "undisclosed lower body injury." On November 1, it was announced DiPietro had undergone another knee surgery after injuring his meniscus. It is unknown whether it is the same knee that was operated on earlier that year. DiPietro returned to the team on December 26, 2008. He won his first game back and earned an assist, which broke Billy Smith's team record for points by a goaltender. 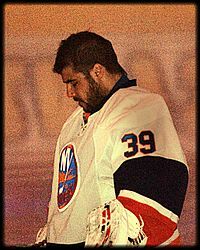 On January 20, 2009, Islanders General Manager Garth Snow announced that DiPietro would miss the rest of the 2008–09 season due to post-arthroscopic surgical swelling in his right knee. On January 8, 2010, DiPietro returned from injury in a 4–3 loss to the Dallas Stars. His last start of 2010 came against the Carolina Hurricanes on February 6. He earned his fifth loss in seven starts, as the Islanders fell 3–1. On February 13, he was listed as day-to-day with the flu, and less than a month later, swelling in his left-knee caused him to be placed on the injured reserve list effective March 2, 2010; he did not return for the rest of the season. DiPietro started the 2010–11 season apparently healthy and worked in a "platoon" tandem with Dwayne Roloson. On December 21, 2010, he was placed on injured reserve, however, due to knee swelling. He returned in December, though due to the strong play of Roloson, he was primarily used as a backup. He made his first start since returning on December 29 in a game against the Pittsburgh Penguins. DiPietro and the Islanders defeated Pittsburgh in a 2–1 shootout decision behind the sharp play of DiPietro. 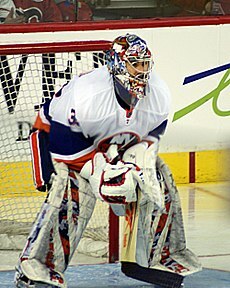 On December 31, the Islanders traded Roloson to the Tampa Bay Lightning, confirming the starting job for DiPietro. On February 2, 2011, In his first game against the Penguins since his shootout win, DiPietro engaged in a rare "goaltender fight" against Pittsburgh's Brent Johnson in the final seconds of the game. He was knocked out and had his jaw broken by a single punch to the face by Johnson. The injuries kept him off the ice for weeks. It is not known if the knee swelling was from the fight or another reason. DiPietro returned shortly to finish the season, wearing the old helmet and cage combo worn by former Islanders goaltender Chris Osgood. The start of the 2011–12 season featured DiPietro in a three-way tandem with Al Montoya and Evgeni Nabokov. Due to a strong pre-season and his performances in DiPietro's absence the previous year, Montoya started the first two games and DiPietro was the backup. During practice for the Islanders' third game, DiPietro took a hard shot to his mask from Brian Rolston, which concussed him and sidelined him indefinitely. DiPietro returned to action in late October, returning to the more conventional one piece goaltender mask he sported for the majority of his career. On November 5, 2011, DiPietro made 25 saves to earn his first win of the 2011–12 season. Shortly after, he injured his groin and was again out indefinitely; he later required surgery to repair a hernia in the area, sidelining him for the remainder of the season. After playing only three games in the lockout shortened 2012–13 season, DiPietro was waived by the Islanders and was sent to their AHL affiliate, the Bridgeport Sound Tigers. He had eight years remaining on his NHL contract. DiPietro started his first game as a member of the Sound Tigers on March 1, 2013. He allowed two goals on the first two shots of the game and five in the first period. He did not return from the locker room for the second period of play as the game eventually ended 7–3 in favor of the opposing Connecticut Whale. DiPietro's series of injuries during the latter part of his NHL career earned him the nickname "Rickety". On July 1, 2013, the Islanders announced that DiPietro would be placed on unconditional waivers and have the remainder of his contract bought out on a compliance. The buyout was completed 2 days later with DiPietro agreeing to be paid 2/3s of the $36 million he would have been owed over the next 8 years at a rate of $1.5 million per year over the next 16 years. DiPietro signed a professional tryout contract on October 25, 2013 with the Carolina Hurricanes' AHL affiliate, Charlotte Checkers, playing his first game 5 days later in which he stopped 25 of 29 shots in a 5–2 loss to the Grand Rapids Griffins. He was cut by the Checkers on November 26. After retiring DiPietro turned to radio hosting and is now a talk show host in New York City at ESPN 98.7. DiPietro made his international debut at the junior level for the United States at the 1999 IIHF World U18 Championships. He would then play in the two following World Junior Championships in 2000 and 2001, awarded in the former as the tournament's best goaltender and selected to the All-Star Team. He made his full international debut soon after his WJC experience with the United States at the 2001 World Championships. He would go on to compete for Team USA in the 2004 World Cup of Hockey and the 2005 World Championships. Along with former Islanders teammates Jason Blake and Mark Parrish, DiPietro was named to the United States national hockey team at the 2006 Winter Olympics in Turin, Italy, in February 2006. DiPietro was the U.S.' number one goaltender for the tournament, starting four of the team's six games. DiPietro played well, sporting a 2.28 GAA, but went 1–3 in the men's tournament. ^ "Rick DiPietro's NHL Player Profile". National Hockey League. Retrieved October 18, 2011. ^ Radio Ink (August 21, 2017). "Hahn Gets His Own Show". Retrieved October 9, 2018. ^ "DiPietro first goalie to go first overall". espn.com. November 8, 2000. Retrieved April 3, 2019. Goalie Michel Plasse was the first pick overall by Montreal in 1968 under rules governing the amateur draft. ^ CBC Sports (November 11, 2000). "Goalie goes first in NHL draft". Retrieved October 9, 2018. ^ CBC Sports (September 12, 2006). "DiPietro inks 15-year deal". Retrieved October 9, 2018. ^ a b The Canadian Press (July 3, 2013). "Islanders officially cut ties with Rick DiPietro, buy out final 8 years of goalie's contract". Retrieved October 9, 2018. ^ a b Kreda, Allan (July 1, 2013). "Islanders Buy Out DiPietro". Retrieved October 9, 2018. ^ Branecky, Paul (November 26, 2013). "Checkers Release Rick DiPietro". Retrieved October 9, 2018. ^ Farber, Michael (February 19, 2001). "Teen Angel". Sports Illustrated. Retrieved January 25, 2017. ^ "New York Islanders sign Rick DiPietro to US$67.5-million 15-year deal". The Canadian Press. 2006. Archived from the original on July 30, 2012. Retrieved September 12, 2006. ^ a b "Without a doubt, DiPietro is Islanders' money man". Newsday. 2007. Retrieved September 16, 2007. ^ "Islanders' DiPietro out 4-6 Weeks with Face, Knee Injuries". TSN. February 4, 2011. Retrieved February 4, 2011. ^ "Islanders place Rick DiPietro, remaining 8 years of contract, on waivers". February 22, 2013. Retrieved February 24, 2013. ^ Hackel, Stu (February 3, 2011). "Red Wings soar; "Rickety" DiPietro sore". SI.com. Retrieved January 25, 2017. ^ "Islanders will buy out DiPietro". Newsday.com. July 1, 2013. Retrieved July 1, 2013. ^ "DiPietro signs with Hurricanes' AHL affiliate". NHL.com. October 26, 2013. Retrieved October 26, 2013. ^ "DiPietro loses debut with Hurricanes' AHL team". ^ "AHL's Checkers release DiPietro from tryout contract". ^ "New ESPN New York 98.7FM Lineup Debuts September 29". ESPN Media Zone. September 26, 2014. Retrieved April 2, 2016. ^ "Canadian All-Stars 13, Planet USA All-Stars 11". American Hockey League. February 14, 2002. Retrieved February 1, 2019. Wikimedia Commons has media related to Rick DiPietro.